Update: This build guide hasn't been updated in a long time. It's probably not very good any more. 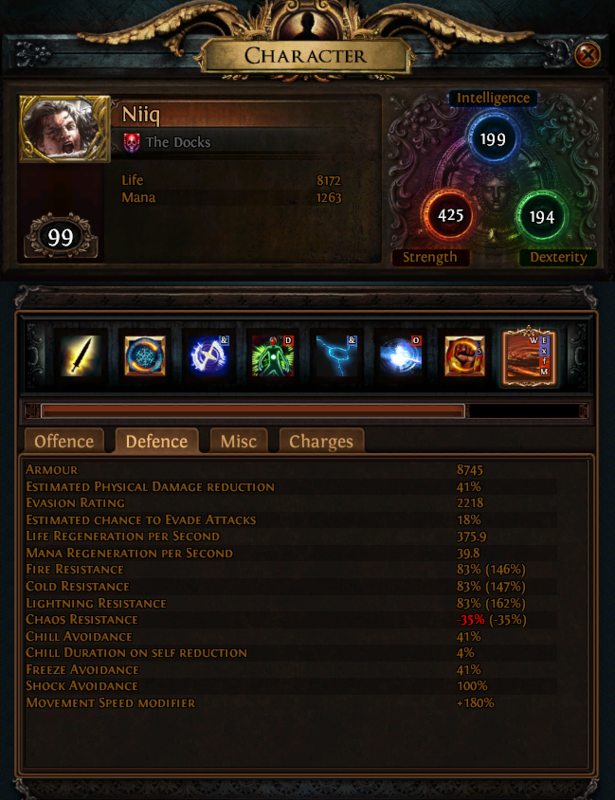 This build utilizes expensive legacy and league specific items, and you’ll probably hate it. The Endless Retch is a build that I have been playing since Ascendancy launched. It is a highly synergistic build that relies on 4 specific components to deal a significant portion of chaos damage to enemies. I’ve drawn a diagram below to outline how this works. Realize that this mechanic works with both attacks and spells. When leech is instant, the chaos damage is added to your attack or spell in the same way that flat elemental damage is added (think Herald of Thunder). I have chosen to use Cyclone as my primary attack, but I have tested almost every other lightning-based (or phys > lightning) gem and found success there as well. Refer to the "Build Variants" section below for some other top picks. The only requirement is that the ability can do Lightning damage. Of course, an ability which converts some physical damage to lightning (i.e. Lightning Arrow) or an ability that deals pure lightning damage (i.e. Spark) will deal even more Chaos damage due to higher % life leeched. Regarding flasks, note that because we are taking most flask nodes on the tree (and because of The Retch’s flask duration bonus), our flasks all last for 10+ seconds and refill more quickly (even overcoming the penalty on The Retch). Additionally, flask effects are boosted 38% from the Alchemist cluster and the Conqueror's Potency jewel. This is primarily to enable the mechanic discussed above with Vessel of Vinktar, but it greatly enhances the effects of the other utility flasks used in this build. It’s important to remember that this build is greatly diminished when flasks are not up. However, it is very easy to obtain 100% flask uptime in almost all situations. Bosses that cannot be burned down in less than 20-30 seconds (mainly Atziri and Shaper) require a trip back to town for flask charges (this is very rare…most bosses are dead in < 10 seconds). In extreme cases, you can use a second Vinktar to double your combat availability. Multiply your DPS by 1.94 to find your actual DPS. This is added Chaos damage from The Retch. Below are some of the best alternatives to using Cyclone. I won't go into much detail, but I'll provide the 6L gems I use, a quick synposis, and a video. Skill tree is basically the same. Refer to the "Variant Gear" section above for gearing changes. For each of these except Static Strike, I recommend a swap weapon with a high single-target DPS setup like Cyclone + Conc effect, or Static Strike. This is my primary variant. If your DPS is high enough, its clearspeed rivals that of Cyclone in the primary build. The key to making this variant work is 4-linking Herald of Ash with 1) iAOE 2) Ele Prolif and 3) Enlighten. With enough overkill, the burn is almost instant and covers your whole screen. This build seems a little inferior to Leap Slam, due to the weaker base damage of Flicker Strike + built in Melee Splash from Slayer. Again, relying on the 4L HoA burn means that we want single large hits, not a bunch of little hits. It's still fun though, and pretty quick! Slap on a Blood Rage gem and off you go. I created this variant mostly due to the popularity of Earthquake. Honestly, I don't care for the ability. Try it out if you'd like. Ahh, Static Strike. The most underrated ability in the game. 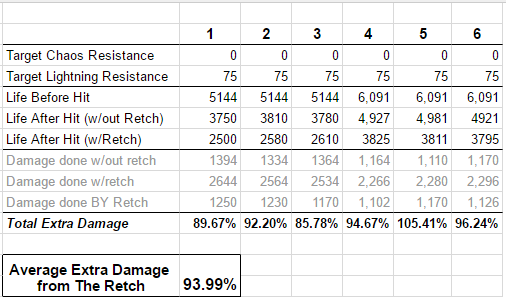 Even on non-Retch builds, nearly nothing else comes close to its 259% base damage. Add in the fact that we can now convert 100% of phys damage to lightning, and this is our single target king. Throw in some free aoe, and it makes a pretty decent map clearing gem too. This is my preferred single target ability these days, and I keep it on my swap weapon. It out performs even Conc Effect Cyclone, but of course makes you vulnerable to stun. This is a bit of a novelty ability, but it has its merits. I always favor point blank AOEs over directional attacks. With a total range of 78 (202% iAOE) combined with 4L HOA, it certainly provides full screen clear. Due to popular demand, I've created a mini-guide for people playing this build in a temporary league. Unless addressed here, everything stays the same as the primary build. Removed all legacy items. 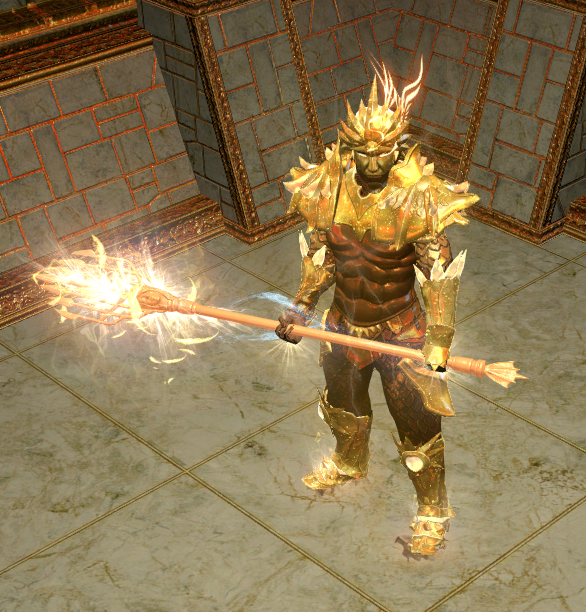 The only "rare" item left in the build is The Retch, which is can be attained in temporary leagues using a "The Wretched" divination card. Switched to the Brain Rattler for 100% lightning conversation and high base damage. You may use Atziri's Disfavour or a high pDPS rare if you wish. Switched from Phys-to-Lightning Conversion Vinktar to a Penetration Vinktar. Only do this if you are using Brain Rattler. Thanks for reading the whole guide! If you have any feedback or see any errors, let me know. Very cool. You could level to 100 fast chaining gorges with that speed. I've mapped with him extensively and he has no issues keeping up with the 2 fastest attack based clear speed builds in the game (LA and KB), in fact, its actually the reverse situation if I run out of quicksilver. Try to get one ring with flat acc roll you have so much % acc from the tree it's a waste. I wonder if this means that Shock double-dips with the retch. I think it does. Occultist seems like a great pairing, with both Void Beacon and Profane Bloom. This build is pretty cool. The Retch/Slayer interaction had occurred to me, but I didn't think to pair it with legacy Vinktar. 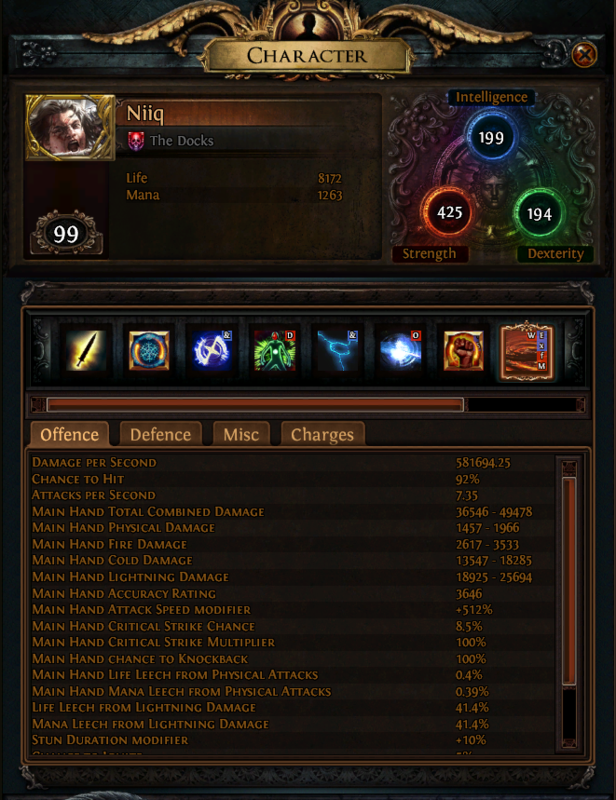 You know a build is crazy when it abuses the best item in the game. One question, why no lightning pen? Your chaos damage depends on your lightning damage, right? Would Arcing Blows be better than Graceful Assault? What is the dmg from the retch without the alchemist node? Yes, you're absolutely right. I tried some of the nearby +Chaos Damage nodes, and they did not effect the Chaos Damage added to my attacks from The Retch. Yeah, I know....I should fix that. It would be really hard to test that, as my Shock and Chaos Damage output are coupled. I think you're probably right though. Great question about lightning pen, and yes you are correct that Lightning Penetration would increase my Chaos Damage. 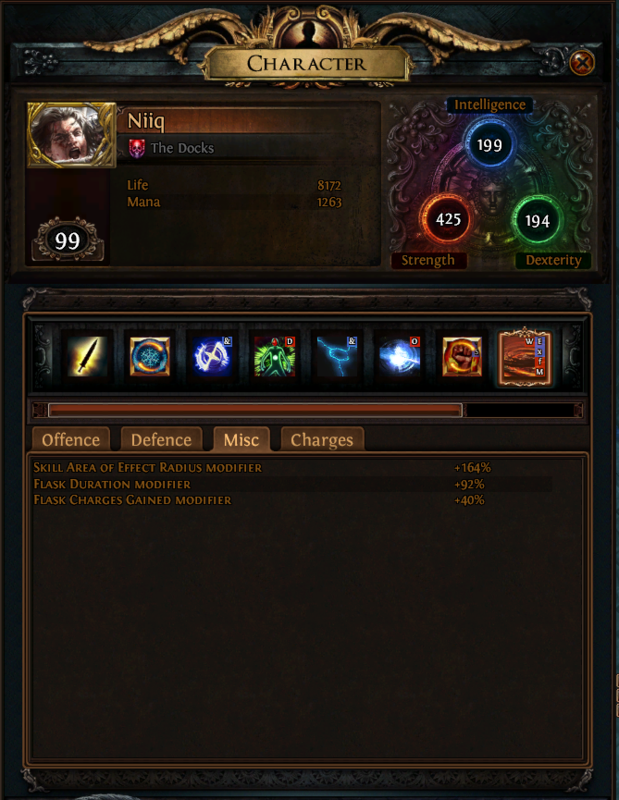 I originally did take Arcing Blows, but I removed it because I had this arbitrary goal of being at 9k+ life. I may revert and be happy with 8k+. It's definitely a big damage increase.